Every parent wants the best for their child and it’s challenging to find positive activities that they will enjoy. Learning piano at a young age was one of the best things that I did in my life. I am grateful to my parents for supporting and encouraging me. Piano is aligned with improved memory, mathematics, social, creative, reading and comprehension skills. Simply put, playing piano encourages your child to use their brain, their physical coordination and their creativity. Above all, playing piano taught me the enjoyment of learning a new skill and the rewards of being disciplined. This in turn, helped me with my schoolwork and sports. It has also given me an appreciation of music and has continued to add richness to my life. Part One – Should my child play the Piano? Why do people play the piano? Piano’s are one of the world’s most popular instruments for good reason! The piano offers you the entire tonal range of an orchestra at your fingertips. As a result, the piano is widely recognised as being the best first instrument to learn. For a budding pianist, the piano has a gentle learning curve. It provides enjoyment and entertainment almost immediately. With a little practice, it is also possible to play almost every song on the piano. There is probably no single ‘life skill’ that is more satisfying than being able to play an instrument well. As a parent, your decision to support your child’s musical development is one of the greatest gifts that you can give. There are many benefits to learning to play piano. Several studies have been done on children who play a musical instrument versus those that don’t. There is considerable evidence that learning an instrument accelerates early child cognitive development. Music is a unique language that speaks to people of all ages and ethnicity. To be able to communicate with a crowd and give a personal interpretation of a piece of music is a great talent to have. Is my child suited to learning an instrument? If your child shows an interest in music and playing an instrument, that’s a huge start! With all of the distractions that kids have today it’s wonderful when they want to learn an instrument. One of the great things about music is its accessibility to everyone. Although some people have a natural gift for playing an instrument, almost everyone can play competently with practice. The parents approach has a major impact on the natural commitment developed by the child. It is important encourage your child and to have fun. This can be in the form of games, playing piano with others and playing familiar songs that your child enjoys. What age can a child start to play the piano? We have all seen the YouTube videos of 4 year old prodigies playing complex classical pieces on the piano. Try to erase that from your mind. In other words, these children are very much the exception and their significant talent puts unnecessary expectations on your child. For the rest of us, there are some natural hurdles that we should recognise. To begin with, the piano has 88 keys, and was designed for adults to play. Children’s hands and strength need time to grow. It is recommended that a child have access to a piano several years before beginning to formally learn the piano. Very young children (3-4 years) can enjoy playing with a parent or friend. Through this, they can become familiar with the instrument and gain confidence. There are many great games and learning exercises that can be lots of fun in these early years. This also imparts the sense that piano is fun to play. Hopefully this will set the stage for wanting to get better at playing the instrument themselves. As a guide, it is generally accepted that the ages between six and eight years old are the best to start formal lessons. The size of your child’s hand can be a determining factor. Your child should be able to span their hand across five white notes. Can your child move individual fingers? Play Hot Cross Buns on the black notes and have your child practice moving their fingers one at a time. This is fun to do together!If they are unable to do this then they are not quite ready for formal learning. A genuine interest in music and to play piano is important. If you want your child to learn but they aren’t really interested, you may have issues as time goes on. Learning the piano properly is a bit of a marathon and enthusiasm and commitment are needed to last the distance. The attention span of children (and adults) is an issue if they are not interested in what they doing/learning. Ask any teacher! Kids are also desensitised through television and computer games and expect to be entertained without having to ‘work’. There are studies that suggest the attention span of a child is their age plus ‘1’ in minutes. Therefore, a four year old will have a 5-minute attention span before they start looking for something else to do. With very young students, the lessons should be as long as you have their attention. This can be as short as 5 minutes and rarely longer than 15 minutes. With practice, and if the lessons are interesting, you will soon find that a 30 minute lesson is possible. Practicing on their own may be wishful thinking until the student is over six. Children under 6 years old also have limited short-term memory. Whereas an adult can store 7-9 items in the short-term memory, a child can only store 2-3. Be careful not to overload the child as it could backfire and create frustration. There are lots of different things for your child to do on the piano. Depending on the age and the experience of your child, here are a few ideas that may be useful. Encourage your child to play around with the piano, through storytelling and games. When they discover something interesting talk to them about it and expand on it. Talk about things like the black notes are in groups of twos and threes and the white notes make up the melody for Do, Re, Mi, Fa, So, La, Ti, Do. Experimenting is an important part of gaining familiarity and a personal connection with the instrument. Tell your child that keys each have a letter (name) and that they are in families (octaves). There are 88 keys on a piano and this can be intimidating at first. Let them get to know one family first (the Octave around middle C). Kids like counting! Imitate a metronome with 1,2,3,4 and repeat. This introduces rhythm. They can use clapping, a drumstick or a note on the piano to participate. A lot should be learnt away from the piano for children under 5. The musical alphabet (forwards and backwards) using cue cards is useful. Sit at the piano together and try storytelling. Something like, Papa Bear (low notes), Mama Bear (middle notes) and Baby Bear (High notes) can be fun. As you can see, there is a lot that can be achieved well before your child begins to formally ‘learn’ the piano. Singing (pitch), dancing (coordination), drumming (rhythm) and listening to music (composition and storytelling) are all very valuable. There are also Preschool music programs that utilise these techniques. What age should a child start Piano Lessons? Most experts agree that the ages between six and eight years old are the best for most young students. At this stage, they have already had Pre-school and Kindergarten and have been taught by adults. Their hand and eye coordination has developed and their ability to understand basic theory is excellent. Reading music is difficult for most children under the ages of six. Be careful not to complicate and frustrate the child with learning notation before they are practiced with other forms of reading. For young students, learning by Rote (memory) can be useful. It gives them a sense of accomplishment and improves their dexterity and physical skills. 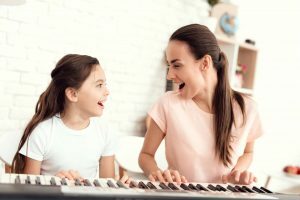 Recommended article: What age can my child start piano lessons? What will your child get from taking lessons? Social Skills: Playing with others and in groups requires consideration of the others timing and volume. This develops advanced listening skills. The first piano lesson can seem a bit intimidating but there is really nothing to worry about. The initial focus is usually around getting comfortable with the teacher. The teacher will be assessing the students playing ability and discussing how the lessons and the practice will work. First lessons usually involve an introduction to the piano and a walk around to understand the lay of the land. There will also be discussions on any books and resources that will be needed. Many students dislike the idea of regular practice. Therefore, a good mix of activities helps to keep things interesting. Above all, try to sequence the practice activities in the correct order. For instance, things that take more brain power should be done at the beginning of the lesson (new music). More familiar exercises like scales should be practiced at the end. Regular practice will help in many key growth areas. Does my child need to practice everyday? There are two significant points relating to practice. First of all, regular practice is the only way to get better. The second point is that practice is only beneficial if the student is engaged. It is important to approach this with some flexibility. For instance, if the student is resisting practice times or taking shortcuts, the content of the practice should be reviewed. It is always possible to add some variety. Talk to the child and find out which parts of practicing are the most enjoyable. A child will have difficulty retaining information and improving their playing skills if they are not enjoying what they are doing. The parent’s involvement with the child is very helpful, especially when they are young. Making practice an enjoyable habit is ideal. The length of the practice should match the child’s interest, goals and attention span. Recommended article: Should my child practice piano everyday? As Plato famously said, ”Music gives a soul to the universe, wings to the mind, flight to the imagination and life to everything.” It’s sort of sad that Plato never got to play a piano! As a student becomes more proficient at playing the piano, they will be invited to competitions and events. This will help them to set goals and showcase their skills. Performing is an excellent way for your child to understand the benefits of hard work. Above all, having something to work towards is exciting and accelerates their musical growth. A positive aspect of public performance is overcoming the nerves on a regular basis. This is invaluable on a personal level later in life. Also, recitals and performances act as milestones and make it easier to recognise the progress that has been achieved. Learning to play an instrument as a child is a great experience and a lifelong journey that many will never travel. I was lucky enough to grow up with my piano playing. The relationship that developed over the years has had a profound influence on my life. I love seeing young pianists beginning their journey and give thanks to my parents for affording me the same opportunity.